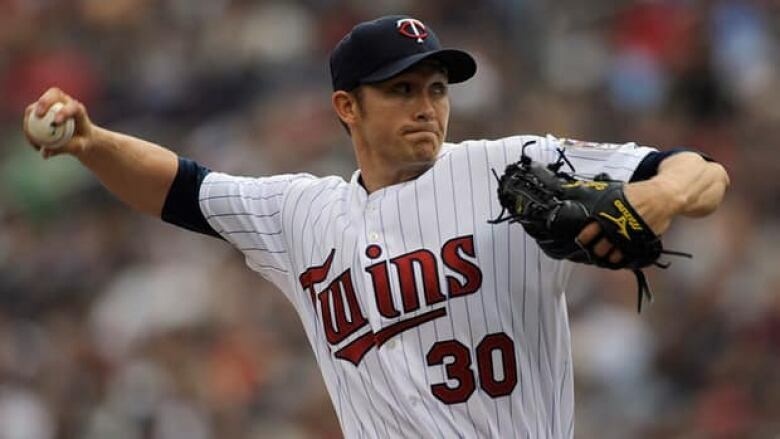 The Chicago Cubs have agreed to a one-year contract with former Minnesota Twins pitcher Scott Baker that guarantees $5.5 million US next season. Scott Baker wants to establish that he can still be an effective pitcher after having elbow surgery, and he'll get his chance with the Chicago Cubs. The 31-year-old righty agreed Tuesday to a one-year deal that guarantees him $5.5 million next season. He could earn an additional $1.5 million in performance bonuses. "I have every intention of being a competitive pitcher next year right away," he said. Baker became a free agent after the Twins declined their $9.25 million option last month. With the Cubs, he gets a $150,000 bonus for reaching 145 innings and an additional $150,000 for every five innings he pitches after that up to 190. Baker was 63-48 with a 4.15 ERA with Minnesota from 2005-11. He underwent Tommy John ligament replacement surgery April 17 and missed last season after being limited to 23 appearances (21 starts) in 2011, but he thinks he'll be ready for the start of spring training. Several teams had shown interest, including the Twins, but the Cubs made it clear they were serious about him. The move fills one of the openings created by the departure of Justin Germano and Jason Berken. Baker wasn't able to throw bullpen sessions for teams because his program had him taking time off, but he expects to resume throwing in about mid-to-late December. He thinks he'll be ready for the start of spring training, although he wasn't making any guarantees. But so far, the rehabilitation has gone about as well as possible. "There are no certainties on rehabs, but we spent quite a bit of time on the medical and on his rehab," Cubs president of baseball operations Theo Epstein said. "It was described by our medical staff as an ideal Tommy John rehab so far. Everything has gone perfectly so far, and he's really attacked it in an ideal manner." He said Baker will probably limited to about five or six innings per start early in the season "if things go perfectly" and added: "We're going to use good judgment every step of the way." He described Baker as "an underrated" pitcher with "a very consistent track record of success" and said the Cubs might want to sign him to an extension. It's not the first time under Epstein that the Cubs have taken a chance on a pitcher coming off Tommy John surgery. They signed Manny Corpas to a one-year non-guaranteed deal last winter and acquired prospect Arodys Vizcaino from Atlanta in the deal that sent Paul Maholm to the Braves last July. The Cubs had also gambled on Maholm by signing him from Pittsburgh last January after he had to shut it down because of a left shoulder strain, and he was 9-6 with a 3.74 ERA they traded him. "You'd love to sign pitchers who are 100 per cent healthy and have never been hurt, but those animals don't really exist. They're certainly hard to find," Epstein said. "The medical assessment on every pitcher is very important and if you have to sign a pitcher who's coming off of surgery, Tommy John is the one you want him to come off because it's a very predictable rehab with a very strong success rate, upward of 95 per cent and even above if you look at more recent information." Baker doesn't think he'll have to change his approach because of the injury, although he's anticipating a few bumps along the way. "I'm going to promise 20 wins and 200 innings," he said. "I think you have to be a realist and you have to realize there are going to be speed bumps along the way, but in saying that, I think you're able to combat those speed bumps and really kind of get to the bottom of the problem or the situation in the first place and kind of allow yourself to work through those things."